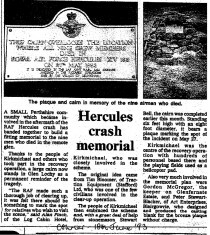 Gillian Andrews kept a scrap book of the events in May 1993 when a RAF Hercules aircraft crashed near Loch Loch on the Glenfernate estate. As she has one of the closest houses to the Bannerfield where the RAF Rescue teams were based she also took photos as they came and went. 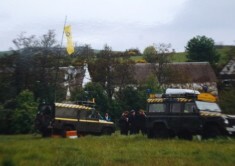 Mrs Andrews was also involved in the memorial service in August 1993 (after a fly past and RAF personnel joining in the opening of the Strathardle Gathering) and the 20 year anniversary in 2013.